Editor's note: A shorter version of this article appeared in the June print issue of Geotimes. Without an atmosphere to protect them, planets, moons and other orbiting bodies are open to all manner of assault  from the impact of a kilometer-wide rock to the steady barrage of high-energy protons from the solar wind. Even the smallest fragments of space debris can inflict damage. And when micrometeorites are traveling at speeds over 100,000 kilometers per hour, the force can be dramatic. 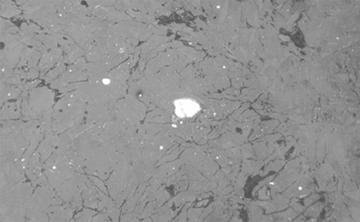 Now researchers have identified a new mineral from the moon that may have been produced during such a micrometeorite attack. Dubbed hapkeite, the crystalline material made of iron and silicon reveals new details about space weathering processes and may help researchers better understand remote observations of the moon and its brethren. Scientists have discovered a new mineral from the Moon, which they have named hapkeite. Shown here in the center (white), hapkeite is a crystalline material made of iron and silicon. Photo courtesy of Larry Taylor. Researchers at the University of Tennessee in Knoxville, working with colleagues at the Carnegie Institution of Washington and the Vernadsky Institute in Russia, identified the mineral within a meteorite recently discovered in the Dhofar region of Oman. Led by Mahesh Anand, the team proposes in the May 4 Proceedings of the National Academy of Sciences that hapkeite forms when small volumes of lunar soil melt and various elements vaporize, during micrometeorite impacts. Although the ultimate temperature at impact is unknown, the researchers believe the value far exceeds 2,000 degrees Celsius. "With such high velocities, even a minute mass of particle turns into a real high-powered kinetic projectile," says Larry Taylor, petrology professor at the University of Tennessee in Knoxville and co-author on the study, funded by NASA and a Russian Foundation for Basic Research Grant. As the iron- and silicon-rich vapor cools, the mineral assembles atom by atom. The unique nature of the iron and silicon mix allow the mineral phase to form instead of quenching into glass, the usual product from similar melting events. This melting-vaporization-deposition process is unlike those found on our present-day Earth, and the only comparable phenomenon is the creation of unusual compounds during the instantaneous energy release from intense lightning strikes. The resulting fulgurites yield some iron-silicon compounds (usually in glasses). Until the discovery of hapkeite, researchers had only seen such a structure as a synthetic phase created in the laboratory. Planetary geologists strive to understand details of space weathering because many remote-sensing studies of planetary chemistry and mineralogy rely on the spectra of light reflecting off of planetary body surfaces; the nature of the body's surface affects the spectral signatures. "Investigating the cause for the formation of this mineral sheds light on the importance of the high-temperature vaporization process that accompanies micrometeorite impacts," Taylor says. "Hapkeite helps us to better understand the space-weathering processes that occur on the Moon and on all airless bodies." However, hapkeite is still rare, says Allan Treiman, Senior Staff Scientist at the Lunar and Planetary Institute in Houston, Texas. He says he would like to see additional research before drawing conclusions about the formation process and the impact of the mineral on spectra. "The hapkeite was found in this meteorite fragment but has not yet been seen in lunar soil samples, so it seems that the mineral is probably rare." Without more data, he says that it would be a"big jump to get from these samples to reflectance data." The researchers named hapkeite in honor of Professor Bruce Hapke, a University of Pittsburgh planetary geologist. Nearly three decades ago, Hapke predicted the presence of vapor-deposited coatings on lunar soil grains and the effect these minute grains might have on lunar reflectance spectra.